Lucius Annaeus Seneca (often known as Seneca the Younger or simply Seneca /ˈsɛnɪkə/; c. 4 BC – AD 65) was a Roman Stoic philosopher, statesman, dramatist, and in one work humorist, of the Silver Age of Latin literature. He was a tutor and later advisor to emperor Nero. While he was forced to commit suicide for alleged complicity in the Pisonian conspiracy to assassinate Nero, some sources state that he may have been innocent. His father was Seneca the Elder, his elder brother was Lucius Junius Gallio Annaeanus, and his nephew was the poet Lucan. He was born in Cordoba in Hispania, and raised in Rome, where he was trained in rhetoric and philosophy (ref. - p. 31). Miriam Griffin says in her biography of Seneca that "the evidence for Seneca's life before his exile in 41 is so slight, and the potential interest of these years, for social history as well as for biography, is so great that few writers on Seneca have resisted the temptation to eke out knowledge with imagination." Griffin also infers from the ancient sources that Seneca was born in either 8, 4, or 1 BC. She thinks he was born between 4 and 1 BC and was a resident in Rome by AD 5. Seneca says that he was carried to Rome in the arms of his mother's stepsister. Griffin says that, allowing for rhetorical exaggeration, means "it is fair to conclude that Seneca was in Rome as a very small boy." Be that as it may, it is clear that he was in Rome at a relatively early stage in his life. Caligula and Fabius were critics of his works, and Columella, Pliny, Tacitus and Dio proponents. This Baroque marble imaginary portrait bust of Seneca, by an anonymous sculptor of the 17th century (Museo del Prado). From AD 54 to 62, Seneca acted as Nero's advisor, together with the praetorian prefect Sextus Afranius Burrus. One byproduct of his influence was that Seneca was appointed suffect consul in 56. 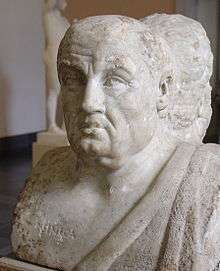 Seneca's influence was said to have been especially strong in the first year. Tacitus and Dio suggest that Nero's early rule, during which time he listened to Seneca and Burrus, was quite competent. However, the ancient sources suggest, over time, Seneca and Burrus lost their influence over the emperor. In 59 they had reluctantly agreed to Agrippina's murder, and afterward, Tacitus reports that Seneca wrote a dishonest exculpation of Nero to the Senate. "Nor was this the only instance in which his conduct was seen to be diametrically opposed to the teachings of his philosophy. For while denouncing tyranny, he was making himself the teacher of a tyrant; while inveighing against the associates of the powerful, he did not hold aloof from the palace itself; and though he had nothing good to say of flatterers, he himself had constantly fawned upon Messalina and the freedmen of Claudius, to such an extent, in fact, as actually to send them from the island of his exile a book containing their praises—a book that he afterwards suppressed out of shame. Though finding fault with the rich, he himself acquired a fortune of 300,000,000 sesterces; and though he censured the extravagances of others, he had five hundred tables of citrus wood with legs of ivory, all identically alike, and he served banquets on them." Dio also reports that Seneca had been involved in forcing large loans on the indigenous British aristocracy in the aftermath of Claudius's Roman conquest of Britain, and then calling them in suddenly and aggressively, which he includes as one of the factors that contributed to Boudica's rebellion. This may have contributed as well to his own downfall. Following Burrus' death in 62, Seneca became the subject of criticism by what Tacitus describes as Nero's "more disreputable advisers." Charges included allegations of excessive wealth, the grandeur of his property, and calculated bids for popularity. Seneca requested an audience with Nero in which he sought permission to retire from public duties, pleading age and infirmity. The two then parted on apparently warm terms. Seneca subsequently adopted a quiet lifestyle on his country estates, concentrating on his studies and seldom visiting Rome. In AD 65, Seneca was caught up in the aftermath of the Pisonian conspiracy, a plot to kill Nero. Although it is unlikely that Seneca conspired, Nero ordered him to kill himself. Seneca followed tradition by severing several veins in order to bleed to death, and his wife Pompeia Paulina attempted to share his fate. A generation after the Julio-Claudian emperors, Tacitus wrote an account of the suicide, which in view of his Republican sympathies is perhaps somewhat romanticized. According to this account, Nero ordered Seneca's wife to be saved. Her wounds were bound up and she made no further attempt to kill herself. As for Seneca himself, his age and diet were blamed for slow loss of blood and extended pain rather than a quick death; he also took poison, which was also not fatal. After dictating his last words to a scribe, and with a circle of friends attending him in his home, he immersed himself in a warm bath, which was expected to speed blood flow and ease his pain. Tacitus wrote, "He was then carried into a bath, with the steam of which he was suffocated, and he was burnt without any of the usual funeral rites. So he had directed in a codicil of his will, even when in the height of his wealth and power he was thinking of life’s close." The early Christian Church was very favorably disposed towards Seneca and his writings, and the church leader Tertullian possessively referred to him as "our Seneca." 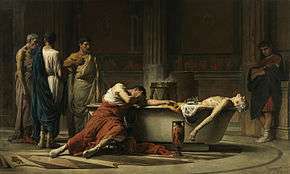 Medieval writers and works (such as the Golden Legend, which erroneously presents Nero as a witness to Seneca's suicide) believed Seneca had been converted to the Christian faith by Saint Paul, and early humanists regarded his fatal bath as a kind of disguised baptism. Dante placed Seneca in the First Circle of Hell, or Limbo. Seneca makes an appearance as a character in Monteverdi's opera L'incoronazione di Poppea. Girolamo Cardano in his apologia of Nero, Neronis Encomium Basel, 1562, printed in English as Nero: An exemplary life (Inkstone, 2012), claims Seneca was a fraud, a fake philosopher, a corrupter of Nero, and that he deserved death. 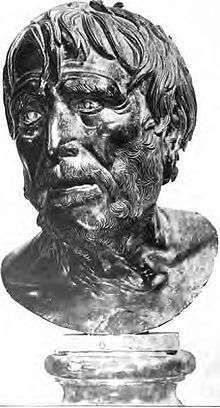 The "Pseudo-Seneca" a Roman bust found at Herculaneum, one of a series of similar sculptures known since the Renaissance, was hoped to be a portrait of Seneca illustrating his Stoic qualities, until the inscribed Roman portrait (illustration above) was identified. Seneca remains one of the few popular Roman philosophers from the period. He appears not only in Dante, but also in Chaucer and to a large degree in Petrarch, who adopted his style in his own essays and who quotes him more than any other authority except Virgil. In the Renaissance, printed editions and translations of his works became common, including an edition by Erasmus and a commentary by John Calvin. John of Salisbury, Erasmus and others celebrated his works. French essayist Montaigne, who gave a spirited defense of Seneca and Plutarch in his Essays, was himself considered by Pasquier a "French Seneca." Similarly, Thomas Fuller praised Joseph Hall as "our English Seneca." Many who have considered his ideas not to be particularly original, still argued he was important in making the Greek philosophers presentable and intelligible. His suicide has also been a popular subject in art, from Jacques-Louis David's 1773 painting The Death of Seneca to the 1951 film Quo Vadis. Even with the admiration of an earlier group of intellectual stalwarts, Seneca is not without his detractors. In his own time, he was widely considered to be a hypocrite or, at least, less than "stoic" in his lifestyle. His tendency to engage in illicit affairs with married women and close ties to Nero's excess test the limits of his teachings on restraint and self-discipline. While banished to Corsica, he wrote pleas for restoration rather incompatible with his advocacy of a simple life and the acceptance of fate. In his Pumpkinification (54) he ridiculed several behaviors and policies of Claudius that every Stoic should have applauded; a reading of the text shows it was also an attempt to gain Nero's favor by flattery—such as proclaiming that Nero would live longer and be wiser than the legendary Nestor. Suillius claims that Seneca acquired some "three hundred million sesterces within the space of four years" through Nero's favor. Robin Campbell, a translator of Seneca's letters, writes that the "stock criticism of Seneca right down the centuries [has been]...the apparent contrast between his philosophical teachings and his practice." According to Tacitus, however, Suillius's accusations did not hold up under scrutiny. It would make sense that Seneca's position of power would make him vulnerable to trumped-up charges, as many public figures were at the time. In 1966 scholar Anna Lydia Motto also challenged this view of Seneca, arguing that his image has been based almost entirely on Suillius's account, while many others who might have lauded him have been lost. 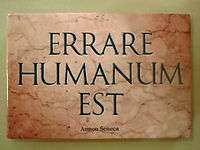 "We are therefore left with no contemporary record of Seneca's life, save for the desperate opinion of Publius Suillius. Think of the barren image we should have of Socrates, had the works of Plato and Xenophon not come down to us and were we wholly dependent upon Aristophanes' description of this Athenian philosopher. To be sure, we should have a highly distorted, misconstrued view. Such is the view left to us of Seneca, if we were to rely upon Suillius alone." More recent work is changing the dominant perception of Seneca as a mere conduit for pre-existing ideas showing originality in Seneca's contribution to the history of ideas. Examination of Seneca's life and thought in relation to contemporary education and to the psychology of emotions is revealing the relevance of his thought. For example, Martha Nussbaum in her discussion of desire and emotion includes Seneca among the Stoics who offered important insights and perspectives on emotions and their role in our lives. Specifically devoting a chapter to his treatment of anger and its management, she shows Seneca's appreciation of the damaging role of uncontrolled anger, and its pathological connections. Nussbaum later extended her examination to Seneca's contribution to political philosophy showing considerable subtlety and richness in his thoughts about politics, education and notions of global citizenship and finding a basis for reform-minded education in Seneca's ideas that allows her to propose a mode of modern education which steers clear of both narrow traditionalism and total rejection of tradition. Some writers regard Seneca as the first great Western thinker on the complex nature and role of gratitude in human relationships. Girolamo Cardano printed a savage attack on Seneca in 1562, in Basel. The title of the book is Encomium Neronis and it is available in English as Girolamo Cardano, Nero: an Exemplary Life Inkstone, 2012. Cardano says that he was a crook of the worst kind, an empty rhetorician who was only thinking to grab money and power, after having poisoned the mind of the young emperor. Cardano says that Seneca well deserved death. Similarly, a more modern and scathing portrayal of Seneca comes in Robert Graves' Claudius the God the sequel novel to I, Claudius. Here, Seneca is portrayed as an unbearable sycophant and half-wit, with Graves quoting several of Seneca's works at points. He is shown to be a pathetic flatterer whose conversion to a Stoic is solely for appeasing Claudius' own ideology. The inclusion of the "Pumpkinification" in Graves' light reads as an unbearable work of flattery to the loathsome Nero and mocking a man that Seneca had groveled to for years. "Pseudo-Seneca" the name used for the uncertain authors of various antique and medieval texts such as De remediis fortuitorum, which purport to be by the Roman author. At least some of these seem to preserve and adapt genuine Senecan content, for example Saint Martin of Braga's (d. c. 580) Formula vitae honestae, or De differentiis quatuor virtutumvitae honestae ("Rules for an Honest Life", or "On the Four Cardinal Virtues"). Early Mss. preserve Martin's preface, where he makes it clear that this was his adaption, but in later copies this was omitted, and the work became thought fully Seneca's work. Works attributed to Seneca include a dozen philosophical essays, one hundred and twenty-four letters dealing with moral issues, nine tragedies, and a satire, the attribution of which is disputed. His authorship of Hercules on Oeta has also been questioned. Seneca generally employed a pointed rhetorical style. His writings expose traditional themes of Stoic philosophy: the universe is governed for the best by a rational providence; contentment is achieved through a simple, unperturbed life in accordance with nature and duty to the state; human suffering should be accepted and has a beneficial effect on the soul; study and learning are important. He emphasized practical steps by which the reader might confront life's problems. In particular, he considered it important to confront one's own mortality. The discussion of how to approach death dominates many of his letters. Many scholars have thought, following the ideas of the 19th century German scholar Friedrich Leo, that Seneca's tragedies were written for recitation only. Other scholars think that they were written for performance and that it is possible that actual performance had taken place in Seneca's lifetime. Ultimately, this issue cannot be resolved on the basis of our existing knowledge. The tragedies of Seneca have been successfully staged in modern times. The dating of the tragedies is highly problematic in the absence of any ancient references. A relative chronology has been suggested on metrical grounds but scholars remain divided. It is inconceivable that they were written in the same year. They are not all based on Greek tragedies; they have a five-act form and differ in many respects from extant Attic drama, and while the influence of Euripides on some of these works is considerable, so is the influence of Virgil and Ovid. Seneca's plays were widely read in medieval and Renaissance European universities and strongly influenced tragic drama in that time, such as Elizabethan England (Shakespeare and other playwrights), France (Corneille and Racine), and the Netherlands (Joost van den Vondel). He is regarded as the source and inspiration for what is known as "Revenge Tragedy," starting with Thomas Kyd's The Spanish Tragedy and continuing well into the Jacobean era. Hercules Oetaeus (Hercules on Oeta): there is doubt by some scholars whether this tragedy was written by Seneca. Octavia: this play closely resembles Seneca's plays in style, but was written a short time after Seneca's death (perhaps between 70-80 A.D.), by someone with a keen knowledge of Seneca's plays and philosophical works. (42) Ad Helviam matrem, De consolatione (To Helvia, On consolation) – Letter to his mother consoling her on his absence during exile. (56) De Clementia (On Clemency) – written to Nero on the need for clemency as a virtue in an emperor. (64) Epistulae morales ad Lucilium – collection of 124 letters dealing with moral issues written to Lucilius Junior. (54) Apocolocyntosis divi Claudii (The Gourdification of the Divine Claudius), a satirical work. (63) Naturales quaestiones [seven books] an insight into ancient theories of cosmology, meteorology, and similar subjects. (58–62/370?) Cujus etiam ad Paulum apostolum leguntur epistolae: These letters, allegedly between Seneca and St Paul, were revered by early authorities, but most scholars now doubt their authenticity. ↑ Bunson, Matthew (1991). A Dictionary of the Roman Empire. Oxford University Press. p. 382. ↑ Fitch, John (2008). Seneca. City: Oxford University Press, USA. p. 32. ISBN 978-0-19-928208-1. ↑ Fortenbaugh, W, ed. (10 December 2010). Theophrastus of Eresus Commentary Volume 6.1: Sources on Ethics. Brill. ISBN 9004194223. Retrieved 2015-04-05. ↑ Miriam T. Griffin. Seneca: A Philosopher in Politics, Oxford 1976. 34. ↑ Hadas, Moses (1958). The Stoic Philosophy of Seneca. p. 7. ↑ Cassius Dio, Book LXI.33.9. ↑ Tacitus (1964). The Annuals of Imperial Rome. Penguin Books. p. 326. ↑ Tacitus (1964). The Annuals of Imperial Rome. Penguin Books. p. 328. ↑ Tacitus (1964). The Annuals of Imperial Rome. Penguin Books. p. 329. ↑ Tacitus (2007). The Annals of Imperial Rome Book XV. Translated by Alfred John Church and William Jackson Brodribb. New York: Barnes & Noble. p. Chapters 60 through 64. ↑ Tacitus (2007). The Annals of Imperial Rome Book XV. Translated by Alfred John Church and William Jackson Brodribb. New York: Barnes & Noble. p. 341. ↑ Richard Mott Gummere, Seneca the philosopher, and his modern message, p.97. ↑ Gummere, Seneca the philosopher, and his modern message, p.106. ↑ Moses Hadas. The Stoic Philosophy of Seneca, 1958. 3. 1 2 Campbell, Robin Letters from a Stoic (London 1998) 11. ↑ Tacitus The Annals (New York 2003) 267. ↑ Tacitus The Annals (New York 2003) All. ↑ Harpham, E. (2004) Gratitude in the History of Ideas,19–37 in M. A. Emmons and M. E. McCulloch, editors, The Psychology of Gratitude, Oxford University Press. ↑ "A large corpus of apocrypha - viz. falsifications, false attributions and extracts - compiled during Late Antiquity and the Middle Ages has been connected to Seneca..."
↑ István Pieter Bejczy, The Cardinal Virtues in the Middle Ages: A Study in Moral Thought from the Fourth to the Fourteenth Century, BRILL, 2011, pp. 55-5 7. ↑ George W.M. Harrison (ed. ), Seneca in performance, London: Duckworth, 2000. ↑ "Seneca: On Clemency". Thelatinlibrary.com. Retrieved 2011-07-26. ↑ "Apocryphal epistles". Earlychristianwritings.com. 2006-02-02. Retrieved 2011-07-26. Di Paola, O. (2015), "Connections between Seneca and Platonism in Epistulae ad Lucilium 58", Athens: ATINER'S Conference Paper Series, No: PHI2015-1445. Inwood, Brad, Reading Seneca. Stoic Philosophy at Rome, Oxford: Oxford University Press, 2008. Lucas, F. L., Seneca and Elizabethan Tragedy (Cambridge University Press, 1922; paperback 2009, ISBN 978-1-108-00358-2); on Seneca the man, his plays, and the influence of his tragedies on later drama. Sevenster, J. N.., Paul and Seneca, Novum Testamentum, Supplements, Vol. 4, Leiden: E. J. Brill, 1961; a comparison of Seneca and the apostle Paul, who were contemporaries. Shelton, Jo-Ann, Seneca's Hercules Furens: Theme, Structure and Style, Göttingen : Vandenhoeck & Ruprecht, 1978. ISBN 3-525-25145-9. A revision of the author's doctoral thesis at the University of California, Berkeley, 1974. Wikimedia Commons has media related to Lucius Annaeus Seneca. Vogt, Katja. "Seneca". Stanford Encyclopedia of Philosophy. Wagoner, Robert. "Seneca". Internet Encyclopedia of Philosophy.